Keeping you updated – Thank you! At the start of the new Cultural and Art’s season, we would like to take a look back at the edition 2017 of the BelgianArtPrize and seize the opportunity to thank the artists, members of the jury, our sponsors, supporters, experts, art lovers and each of you who have contributed to make last year’s edition so successful. In May 2016 we were pleased to announce the new concept of the BelgianArtPrize whereby 248 professional art experts and art collectors were to nominate the most talented leading artists in Belgium. 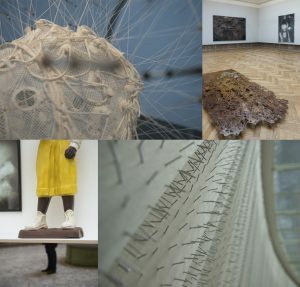 Between the artists chosen, the Jury nominated the 4 finalists for the BelgianArtPrize: Otobong Nkanga, Maarten Vanden Eynde, Edith Dekyndt and Denicolaï & Provoost. The first prize thereafter went to Otobong Nkanga. Over 10.000 members of the public visited the exhibition at the BOZAR/Centre for Fine Arts, historical partner of the BelgianArtPrize, casting their vote to elect the Artist to be granted the ING Public Prize, the winner of the ING Public Prize being Maarten Vanden Eynde. Their artworks will soon be exhibited around the world and we would like to invite you to follow these artists by visiting our website www.belgianartprize.be, twitter or instagram and soon too on facebook! This autumn we will once more invite art experts to nominate the most talented leading artists in Belgium and we are very grateful for their continuous enthusiasm to do so thanks to their commitment and keen interest in the Belgian Art scene. We have greatly appreciated the constructive suggestions and observations on the new path chosen and we would also like to thank the art critics and journalists in whom we found true ambassadors of the artists and art prize. We invite you to take a look at the press releases, radio and television coverage on our website! Our partners, Flanders Arts Institute, ArtBrussels, the artmagazine <H>art and the printing company Cassochrome as well as our sponsors, ING, Eeckman Art&Insurance and Linklaters greatly contributed to give the BelgianArtPrize and its participating artists an enhanced international exposure and we are extremely grateful to them for their trust and structural support. We’d like to keep you informed on our future activities and already prepare the next edition of the BelgianArtPrize and exhibit that will take place at BOZAR/Centre for Fine Arts in spring 2019.